High-density lipoprotein (HDL) is one of the five major groups of lipoproteins. Lipoproteins are complex particles composed of multiple proteins which transport all fat molecules (lipids) around the body within the water outside cells. They are typically composed of 80-100 proteins per particle (organized by one, two or three ApoA; more as the particles enlarge picking up and carrying more fat molecules) and transporting up to hundreds of fat molecules per particle. Lipoproteins have long been divided into 5 subgroups, by density/size (an inverse relationship), which also correlates with function and incidence of cardiovascular events. Unlike the larger lipoprotein particles which deliver fat molecules to cells, HDL particles remove fat molecules from cells which need to export fat molecules. The lipids carried include cholesterol, phospholipids, and triglycerides, amounts of each are quite variable. Increasing concentrations of HDL particles are strongly associated with decreasing accumulation of atherosclerosis within the walls of arteries. This is important because atherosclerosis eventually results in sudden plaque ruptures, cardiovascular disease, stroke and other vascular diseases. 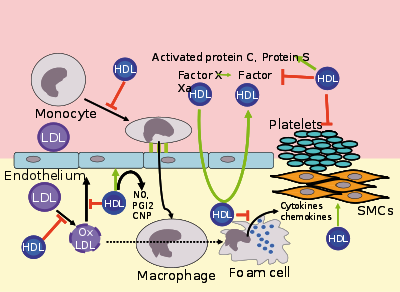 HDL particles are sometimes referred to as "good cholesterol" because they can transport fat molecules out of artery walls, reduce macrophage accumulation, and thus help prevent or even regress atherosclerosis, but studies have shown that HDL-lacking mice still have the ability to transport cholesterol to bile, suggesting that there are alternative mechanisms for cholesterol removal. Because of the high cost of directly measuring HDL and LDL (low-density lipoprotein) protein particles, blood tests are commonly performed for the surrogate value, HDL-C, i.e. the cholesterol associated with ApoA-1/HDL particles. In healthy individuals, about 30% of blood cholesterol, along with other fats, is carried by HDL. This is often contrasted with the amount of cholesterol estimated to be carried within low-density lipoprotein particles, LDL, and called LDL-C. HDL particles remove fats and cholesterol from cells, including within artery wall atheroma, and transport it back to the liver for excretion or re-utilization; thus the cholesterol carried within HDL particles (HDL-C) is sometimes called "good cholesterol" (despite being the same as cholesterol in LDL particles). Those with higher levels of HDL-C tend to have fewer problems with cardiovascular diseases, while those with low HDL-C cholesterol levels (especially less than 40 mg/dL or about 1 mmol/L) have increased rates for heart disease. Higher native HDL levels are correlated with better cardiovascular health, but it does not appear that further increasing one's HDL improves cardiovascular outcomes. The remainder of the serum cholesterol after subtracting the HDL is the non-HDL cholesterol. The concentration of these other components, which may cause atheroma, is known as the non-HDL-C. This is now preferred to LDL-C as a secondary marker as it has been shown to be a better predictor and it is more easily calculated. HDL is the smallest of the lipoprotein particles. It is the densest because it contains the highest proportion of protein to lipids. Its most abundant apolipoproteins are apo A-I and apo A-II. A rare genetic variant, ApoA-1 Milano, has been documented to be far more effective in both protecting against and regressing arterial disease; atherosclerosis. The liver synthesizes these lipoproteins as complexes of apolipoproteins and phospholipid, which resemble cholesterol-free flattened spherical lipoprotein particles, whose NMR structure was recently published; the complexes are capable of picking up cholesterol, carried internally, from cells by interaction with the ATP-binding cassette transporter A1 (ABCA1). A plasma enzyme called lecithin-cholesterol acyltransferase (LCAT) converts the free cholesterol into cholesteryl ester (a more hydrophobic form of cholesterol), which is then sequestered into the core of the lipoprotein particle, eventually causing the newly synthesized HDL to assume a spherical shape. HDL particles increase in size as they circulate through the bloodstream and incorporate more cholesterol and phospholipid molecules from cells and other lipoproteins, for example by the interaction with the ABCG1 transporter and the phospholipid transport protein (PLTP). HDL transports cholesterol mostly to the liver or steroidogenic organs such as adrenals, ovary, and testes by both direct and indirect pathways. HDL is removed by HDL receptors such as scavenger receptor BI (SR-BI), which mediate the selective uptake of cholesterol from HDL. In humans, probably the most relevant pathway is the indirect one, which is mediated by cholesteryl ester transfer protein (CETP). This protein exchanges triglycerides of VLDL against cholesteryl esters of HDL. As the result, VLDLs are processed to LDL, which are removed from the circulation by the LDL receptor pathway. The triglycerides are not stable in HDL, but are degraded by hepatic lipase so that, finally, small HDL particles are left, which restart the uptake of cholesterol from cells. The cholesterol delivered to the liver is excreted into the bile and, hence, intestine either directly or indirectly after conversion into bile acids. Delivery of HDL cholesterol to adrenals, ovaries, and testes is important for the synthesis of steroid hormones. Several steps in the metabolism of HDL can participate in the transport of cholesterol from lipid-laden macrophages of atherosclerotic arteries, termed foam cells, to the liver for secretion into the bile. This pathway has been termed reverse cholesterol transport and is considered as the classical protective function of HDL toward atherosclerosis. HDL carries many lipid and protein species, several of which have very low concentrations but are biologically very active. For example, HDL and its protein and lipid constituents help to inhibit oxidation, inflammation, activation of the endothelium, coagulation, and platelet aggregation. All these properties may contribute to the ability of HDL to protect from atherosclerosis, and it is not yet known which are the most important. In addition, a small subfraction of HDL lends protection against the protozoan parasite Trypanosoma brucei brucei. This HDL subfraction, termed trypanosome lytic factor (TLF), contains specialized proteins that, while very active, are unique to the TLF molecule. In the stress response, serum amyloid A, which is one of the acute-phase proteins and an apolipoprotein, is under the stimulation of cytokines (interleukin 1, interleukin 6), and cortisol produced in the adrenal cortex and carried to the damaged tissue incorporated into HDL particles. At the inflammation site, it attracts and activates leukocytes. In chronic inflammations, its deposition in the tissues manifests itself as amyloidosis. It has been postulated that the concentration of large HDL particles more accurately reflects protective action, as opposed to the concentration of total HDL particles. This ratio of large HDL to total HDL particles varies widely and is measured only by more sophisticated lipoprotein assays using either electrophoresis (the original method developed in the 1970s) or newer NMR spectroscopy methods (See also nuclear magnetic resonance and spectroscopy), developed in the 1990s. Five subfractions of HDL have been identified. From largest (and most effective in cholesterol removal) to smallest (and least effective), the types are 2a, 2b, 3a, 3b, and 3c. Lipids are a heterogeneous group of compounds which are relatively insoluble in water and soluble in non-polar solvents. Triglycerides (TGs), cholesterol, and phospholipids are the major lipids in the body. They are transported as complexes of lipid and proteins known as lipoproteins. TGs (triglycerides): TGs are formed by combining glycerol with three molecules of fatty acid. TGs, as major components of VLDL and chylomicrons, play an important role in metabolism. When the body requires fatty acids as an energy source, the hormone glucagon signals the breakdown of the TGs by lipase to release free fatty acids (FFA). TGs are water-insoluble, non-polar neutral fats. These are not the structural components of biological membranes.TGs synthesis and storage mostly occurs in liver and adipose tissue. FFA and glycerol must be activated prior to the synthesis of TGs into Acyl-CoA and glycerol-3-phosphate respectively. Cholesterol: The name cholesterol originates from the Greek chole- (bile) and stereos (solid), and the chemical suffix-ol for an alcohol. It is an essential structural component of cell membrane, where it is required to establish proper membrane permeability and fluidity. In addition, cholesterol is an important component for the manufacture of bile acids, steroid hormones, and vitamin D. Although cholesterol is an important and necessary molecule, a high level of serum cholesterol is an indicator for diseases such as heart disease. About 20-25% of total daily cholesterol production occurs in the liver. Phospholipids: Phospholipids are TGs that are covalently bonded to a phosphate group by an ester linkage. Phospholipids perform important functions including regulating membrane permeability and in maintaining electron transport chain in mitochondria. They participate in the reverse cholesterol transport and thus help in the removal of cholesterol from the body. They are involved in signal transmission across membranes and they act as detergents and help in solubilization of cholesterol. Lipoprotein: These consist of a central core of a hydrophobic lipid (including TGs and cholesteryl esters) encased in a hydrophilic coat of polar phospholipid, free cholesterol and apolipoprotein. There are six main classes of lipoprotein, differing in the relative proportion of the core lipids and in the type of apoprotein. Men tend to have noticeably lower HDL levels, with smaller size and lower cholesterol content, than women. Men also have an increased incidence of atherosclerotic heart disease. Alcohol consumption tends to raise HDL levels, and moderate alcohol consumption is associated with lower cardiovascular and all-cause mortality. Recent studies confirm the fact that HDL has a buffering role in balancing the effects of the hypercoagulable state in type 2 diabetics and decreases the high risk of cardiovascular complications in these patients. Also, the results obtained in this study revealed that there was a significant negative correlation between HDL and activated partial thromboplastin time (APTT). Epidemiological studies have shown that high concentrations of HDL (over 60 mg/dL) have protective value against cardiovascular diseases such as ischemic stroke and myocardial infarction. Low concentrations of HDL (below 40 mg/dL for men, below 50 mg/dL for women) increase the risk for atherosclerotic diseases. Data from the landmark Framingham Heart Study showed that, for a given level of LDL, the risk of heart disease increases 10-fold as the HDL varies from high to low. On the converse, however, for a fixed level of HDL, the risk increases 3-fold as LDL varies from low to high. Even people with very low LDL levels are exposed to increased risk if their HDL levels are not high enough. Clinical laboratories formerly measured HDL cholesterol by separating other lipoprotein fractions using either ultracentrifugation or chemical precipitation with divalent ions such as Mg2+, then coupling the products of a cholesterol oxidase reaction to an indicator reaction. The reference method still uses a combination of these techniques. Most laboratories now use automated homogeneous analytical methods in which lipoproteins containing apo B are blocked using antibodies to apo B, then a colorimetric enzyme reaction measures cholesterol in the non-blocked HDL particles. HPLC can also be used. Subfractions (HDL-2C, HDL-3C) can be measured, but clinical significance of these subfractions has not been determined. The measurement of apo-A reactive capacity can be used to measure HDL cholesterol but is thought to be less accurate. The American Heart Association, NIH and NCEP provide a set of guidelines for fasting HDL levels and risk for heart disease. High LDL with low HDL level is an additional risk factor for cardiovascular disease. As technology has reduced costs and clinical trials have continued to demonstrate the importance of HDL, methods for directly measuring HDL concentrations and size (which indicates function) at lower costs have become more widely available and increasingly regarded as important for assessing individual risk for progressive arterial disease and treatment methods. Since the HDL particles have a net negative charge and vary by density & size, ultracentrifugation combined with electrophoresis have been utilized since before 1950 to enumerate the concentration of HDL particles and sort them by size with a specific volume of blood plasma. Larger HDL particles are carrying more cholesterol. Concentration and sizes of lipoprotein particles can be estimated using nuclear magnetic resonance fingerprinting. The HDL particle concentrations are typically categorized by event rate percentiles based on the people participating and being tracked in the MESA trial, a medical research study sponsored by the United States National Heart, Lung, and Blood Institute. The lowest incidence of atherosclerotic events over time occurs within those with both the highest concentrations of total HDL particles (the top quarter, >75%) and the highest concentrations of large HDL particles. Multiple additional measures, including LDL particle concentrations, small LDL particle concentrations, VLDL concentrations, estimations of insulin resistance and standard cholesterol lipid measurements (for comparison of the plasma data with the estimation methods discussed above) are routinely provided in clinical testing. Fasting serum lipids have been associated with short term verbal memory. In a large sample of middle aged adults, low HDL cholesterol was associated with poor memory and decreasing levels over a five-year follow-up period were associated with decline in memory. While higher HDL levels are correlated with cardiovascular health, no medication used to increase HDL has been proven to improve health. In other words, while high HDL levels might correlate with better cardiovascular health, specifically increasing one's HDL might not increase cardiovascular health. The remaining possibilities are that either good cardiovascular health causes high HDL levels, there is some third factor which causes both, or this is a coincidence with no causal link. HDL lipoprotein particles that bear apolipoprotein C3 are associated with increased, rather than decreased, risk for coronary heart disease. Decreased intake of simple carbohydrates. Consumption of medium-chain triglycerides (MCTs) such as caproic acid, caprylic acid, capric acid, and lauric acid. Most saturated fats increase HDL cholesterol to varying degrees but also raise total and LDL cholesterol. A high-fat, adequate-protein, low-carbohydrate ketogenic diet may have similar response to taking niacin (vitamin B3) as described below (lowered LDL and increased HDL) through beta-hydroxybutyrate coupling the Niacin receptor 1. HDL levels can be increased by smoking cessation, or mild to moderate alcohol intake. Cannabis in unadjusted analyses, past and current cannabis use was not associated with higher HDL-C levels. A study performed in 4635 patients demonstrated no effect on the HDL-C levels (P=0.78) [the mean (standard error) HDL-C values in control subjects (never used), past users and current users were 53.4 (0.4), 53.9 (0.6) and 53.9 (0.7) mg/dL, respectively]. Pharmacological therapy to increase the level of HDL cholesterol includes use of fibrates and niacin. Fibrates have not been proven to have an effect on overall deaths from all causes, despite their effects on lipids. Niacin (vitamin B3) increases HDL by selectively inhibiting hepatic diacylglycerol acyltransferase 2, reducing triglyceride synthesis and VLDL secretion through a receptor HM74 otherwise known as niacin receptor 2 and HM74A / GPR109A, niacin receptor 1. Pharmacologic (1- to 3-gram/day) niacin doses increase HDL levels by 10–30%, making it the most powerful agent to increase HDL-cholesterol. A randomized clinical trial demonstrated that treatment with niacin can significantly reduce atherosclerosis progression and cardiovascular events. Niacin products sold as "no-flush", i.e. not having side-effects such as "niacin flush", do not, however, contain free nicotinic acid and are therefore ineffective at raising HDL, while products sold as "sustained-release" may contain free nicotinic acid, but "some brands are hepatotoxic"; therefore the recommended form of niacin for raising HDL is the cheapest, immediate-release preparation. Both fibrates and niacin increase artery toxic homocysteine, an effect that can be counteracted by also consuming a multivitamin with relatively high amounts of the B-vitamins, but multiple European trials of the most popular B-vitamin cocktails, trial showing 30% average reduction in homocysteine, while not showing problems have also not shown any benefit in reducing cardiovascular event rates. A 2011 niacin study was halted early because patients adding niacin to their statin treatment showed no increase in heart health, but did experience an increase in the risk of stroke. In contrast, while the use of statins is effective against high levels of LDL cholesterol, most have little or no effect in raising HDL cholesterol. Rosuvastatin and pitavastatin, however, have been demonstrated to significantly raise HDL levels. Lovaza has been shown to increase HDL-C. However, the best evidence to date suggests it has no benefit for primary or secondary prevention of cardiovascular disease. Though it has not yet been FDA-approved, the PPAR modulator (sometimes referred to as a SARM) GW501516, currently a research chemical (not for human consumption), has shown a positive effect on HDL-C and an antiatherogenic where LDL is an issue. ^ Betteridge; et al. (2008). "Structural requirements for PCSK9-mediated degradation of the low-density lipoprotein receptor". PNAS. 105 (35): 13045–13050. doi:10.1073/pnas.0806312105. PMC 2526098. ^ "LDL and HDL Cholesterol: What's Bad and What's Good?". American Heart Association. 2 July 2009. Retrieved 8 October 2009. ^ Toth PP (Feb 2005). "Cardiology patient page. The "good cholesterol": high-density lipoprotein". Circulation. 111 (5): e89–e91. doi:10.1161/01.CIR.0000154555.07002.CA. PMID 15699268. ^ Sirtori, Cesare R. (October 2006). "HDL and the progression of atherosclerosis: new insights". European Heart Journal Supplements. ^ a b "NIH stops clinical trial on combination cholesterol treatment". National Institute of Health. National Heart, Lung, and Blood Institute (NHLBI). Retrieved 2 June 2011. ^ Huang CX, Zhang YL (2013). "The target of regulating the ATP-binding cassette A1 protein (ABCA1): promoting ABCA1-mediated cholesterol efflux in different cells". Current Pharmaceutical Biotechnology. 14 (6): 623–31. doi:10.2174/138920101131400228. PMID 24016265. ^ Stephens NA, Kieft R, Macleod A, Hajduk SL (Dec 2012). "Trypanosome resistance to human innate immunity: targeting Achilles' heel". Trends in Parasitology. 28 (12): 539–45. doi:10.1016/j.pt.2012.09.002. PMC 4687903. PMID 23059119. ^ Kwiterovich PO (Dec 2000). "The metabolic pathways of high-density lipoprotein, low-density lipoprotein, and triglycerides: a current review". The American Journal of Cardiology. 86 (12A): 5L–10L. doi:10.1016/S0002-9149(00)01461-2. PMID 11374859. ^ HDL, HDL2, and HDL3 subfractions, and the risk of acute myocardial infarction. A prospective population study in eastern Finnish men. ^ Ruidavets JB, Ducimetière P, Arveiler D, Amouyel P, Bingham A, Wagner A, Cottel D, Perret B, Ferrières J (Jan 2002). "Types of alcoholic beverages and blood lipids in a French population". Journal of Epidemiology and Community Health. 56 (1): 24–8. doi:10.1136/jech.56.1.24. PMC 1732002. PMID 11801616. ^ Mard-Soltani M, Dayer MR, Shamshirgar-Zadeh A, Ali-Bahar H, Nasirbagheban Z (April 2012). "The Buffering Role of HDL in Balancing the Effects of Hypercoagulable State in Type 2 Diabetes". J Applied sciences. 12 (8): 745–52. doi:10.3923/jas.2012.745.752. ^ Rahilly-Tierney CR, Spiro A, Vokonas P, Gaziano JM (Apr 2011). "Relation between high-density lipoprotein cholesterol and survival to age 85 years in men (from the VA normative aging study)". The American Journal of Cardiology. 107 (8): 1173–7. doi:10.1016/j.amjcard.2010.12.015. PMID 21296318. ^ Rubins HB, Robins SJ, Collins D, Nelson DB, Elam MB, Schaefer EJ, Faas FH, Anderson JW (2002). "Diabetes, plasma insulin, and cardiovascular disease: subgroup analysis from the Department of Veterans Affairs high-density lipoprotein intervention trial (VA-HIT)". Archives of Internal Medicine. 162 (22): 2597–604. doi:10.1001/archinte.162.22.2597. PMID 12456232. ^ Barter P, Gotto AM, LaRosa JC, Maroni J, Szarek M, Grundy SM, Kastelein JJ, Bittner V, Fruchart JC (Sep 2007). "HDL cholesterol, very low levels of LDL cholesterol, and cardiovascular events". The New England Journal of Medicine. 357 (13): 1301–10. doi:10.1056/NEJMoa064278. PMID 17898099. ^ "National Reference System for Cholesterol – Cholesterol Reference Method Laboratory Network – HDL Cholesterol Certification Protocol for Manufacturers" (PDF). CDC. Retrieved 10 November 2013. ^ Warnick GR, Nauck M, Rifai N (Sep 2001). "Evolution of methods for measurement of HDL-cholesterol: from ultracentrifugation to homogeneous assays". Clinical Chemistry. 47 (9): 1579–1596. PMID 11514391. ^ Okazaki M, Sasamoto K, Muramatsu T, Hosaki S (Oct 1997). "Evaluation of precipitation and direct methods for HDL-cholesterol assay by HPLC". Clinical Chemistry. 43 (10): 1885–90. PMID 9342008. ^ Hirano T, Nohtomi K, Koba S, Muroi A, Ito Y (May 2008). "A simple and precise method for measuring HDL-cholesterol subfractions by a single precipitation followed by homogenous HDL-cholesterol assay". Journal of Lipid Research. 49 (5): 1130–6. doi:10.1194/jlr.D700027-JLR200. PMID 18223297. ^ Superko HR, Pendyala L, Williams PT, Momary KM, King SB 3rd, Garrett BC (2012). "High-density lipoprotein subclasses and their relationship to cardiovascular disease". Journal of Clinical Lipidology. 6 (6): 496–523. doi:10.1016/j.jacl.2012.03.001. PMID 23312047. ^ "Cholesterol Levels". American Heart Association. Archived from the original on 8 February 2010. Retrieved 14 November 2009. ^ "What Do My Cholesterol Levels Mean?" (PDF). American Heart Association. September 2007. Archived from the original (PDF) on 3 December 2008. Retrieved 14 November 2009. ^ ASHWOOD, E. R., BURTIS, C. A., & BRUNS, D. E. (2008). Tietz fundamentals of clinical chemistry. (6th ed., p. 415). St. Louis, MO: Saunders Elsevier. ^ Jeyarajah EJ, Cromwell WC, Otvos JD (2006). "Lipoprotein particle analysis by nuclear magnetic resonance spectroscopy". Clin. Lab. Med. 26 (4): 847–70. doi:10.1016/j.cll.2006.07.006. PMID 17110242. ^ Singh-Manoux A, Gimeno D, Kivimaki M, Brunner E, Marmot MG (Aug 2008). "Low HDL cholesterol is a risk factor for deficit and decline in memory in midlife: the Whitehall II study". Arteriosclerosis, Thrombosis, and Vascular Biology. 28 (8): 1556–62. doi:10.1161/ATVBAHA.108.163998. PMC 2581752. PMID 18591462. ^ Keene D, Price C, Shun-Shin MJ, Francis DP (Jul 18, 2014). "Effect on cardiovascular risk of high density lipoprotein targeted drug treatments niacin, fibrates, and CETP inhibitors: meta-analysis of randomised controlled trials including 117,411 patients". BMJ. 349: g4379. doi:10.1136/bmj.g4379. PMC 4103514. PMID 25038074. ^ Sacks FM, Zheng C, Cohn JS (2011). "Complexities of plasma apolipoprotein C-III metabolism". Journal of Lipid Research. 52 (6): 1067–1070. doi:10.1194/jlr.E015701. PMC 3090227. PMID 21421846. ^ Fogoros, Richard N. (15 September 2009). "Raising Your HDL Levels Increasing the GOOD cholesterol". About.com. Retrieved 8 October 2009. ^ "Effects of dietary fatty acids and carbohydrates on the ratio of serum total to HDL cholesterol and on serum lipids and apolipoproteins: a meta-analysis of 60 controlled trials". Ajcn.org. Retrieved 2015-11-05. ^ Ma Y, Li Y, Chiriboga DE, Olendzki BC, Hebert JR, Li W, Leung K, Hafner AR, Ockene IS (Apr 2006). "Association between carbohydrate intake and serum lipids". Journal of the American College of Nutrition. 25 (2): 155–163. doi:10.1080/07315724.2006.10719527. PMC 1479303. PMID 16582033. Archived from the original on 2012-01-15. Retrieved 2012-09-01. ^ Siri-Tarino PW, Sun Q, Hu FB, Krauss RM (Mar 2010). "Saturated fat, carbohydrate, and cardiovascular disease". The American Journal of Clinical Nutrition. 91 (3): 502–9. doi:10.3945/ajcn.2008.26285. PMC 2824150. PMID 20089734. ^ Krauss RM, Blanche PJ, Rawlings RS, Fernstrom HS, Williams PT (May 2006). "Separate effects of reduced carbohydrate intake and weight loss on atherogenic dyslipidemia". The American Journal of Clinical Nutrition. 83 (5): 1025–1031. PMID 16685042. ^ Spate-Douglas T, Keyser RE (Jun 1999). "Exercise intensity: its effect on the high-density lipoprotein profile". Archives of Physical Medicine and Rehabilitation. 80 (6): 691–5. doi:10.1016/S0003-9993(99)90174-0. PMID 10378497. ^ a b Hausenloy DJ, Yellon DM (Jun 2008). "Targeting residual cardiovascular risk: raising high-density lipoprotein cholesterol levels". Heart. 94 (6): 706–14. doi:10.1136/hrt.2007.125401. PMID 18480348. ^ Rosanoff A, Seelig MS (Oct 2004). "Comparison of mechanism and functional effects of magnesium and statin pharmaceuticals". Journal of the American College of Nutrition. 23 (5): 501S–505S. doi:10.1080/07315724.2004.10719389. PMID 15466951. Archived from the original on 2010-08-31. Retrieved 2010-12-13. HMG CoA Reductase is an important enzyme in lipid and cholesterol metabolism, but it is not the only one. The statins act by inhibiting, temporarily, the enzyme, in a dose response relationship whereas the magnesium ion (Mg2+) is an important part of a complex control and regulation of this important pathway. Both lower LDL-C, some statins can raise HDL-C and lower triglycerides, but Mg supplements do both quite reliably. ^ Hermansen K, Dinesen B, Hoie LH, Morgenstern E, Gruenwald J (2003). "Effects of soy and other natural products on LDL:HDL ratio and other lipid parameters: a literature review". Advances in Therapy. 20 (1): 50–78. doi:10.1007/bf02850119. PMID 12772818. ^ "The Power of Fish". The Cleveland Clinic Heart and Vascular Institute. Retrieved 8 October 2009. ^ "Vitamins and Supplements Lifestyle Guide – Flaxseed". WebMD. Retrieved 12 August 2013. ^ Mensink RP, Zock PL, Kester AD, Katan MB (May 2003). "Effects of dietary fatty acids and carbohydrates on the ratio of serum total to HDL cholesterol and on serum lipids and apolipoproteins: a meta-analysis of 60 controlled trials". The American Journal of Clinical Nutrition. 77 (5): 1146–55. PMID 12716665. ^ "Trans fat: Avoid this cholesterol double whammy". Mayo Foundation for Medical Education and Research (MFMER). Retrieved 25 June 2010. ^ Thijssen, M.A. and R.P. Mensink. (2005). Fatty Acids and Atherosclerotic Risk. In Arnold von Eckardstein (Ed.) Atherosclerosis: Diet and Drugs. Springer. pp. 171–172. ISBN 978-3-540-22569-0. ^ Baer DJ, Judd JT, Clevidence BA, Muesing RA, Campbell WS, Brown ED, Taylor PR (Mar 2002). "Moderate alcohol consumption lowers risk factors for cardiovascular disease in postmenopausal women fed a controlled diet". The American Journal of Clinical Nutrition. 75 (3): 593–599. doi:10.1093/ajcn/75.3.593. PMID 11864868. ^ van der Gaag MS, van Tol A, Vermunt SH, Scheek LM, Schaafsma G, Hendriks HF (Dec 2001). "Alcohol consumption stimulates early steps in reverse cholesterol transport". Journal of Lipid Research. 42 (12): 2077–2083. PMID 11734581. ^ Hendriks HF, Veenstra J, van Tol A, Groener JE, Schaafsma G (1998). "Moderate doses of alcoholic beverages with dinner and postprandial high density lipoprotein composition". Alcohol and Alcoholism. 33 (4): 403–410. doi:10.1093/oxfordjournals.alcalc.a008410. PMID 9719399. ^ Clevidence BA, Reichman ME, Judd JT, Muesing RA, Schatzkin A, Schaefer EJ, Li Z, Jenner J, Brown CC, Sunkin M (Feb 1995). "Effects of alcohol consumption on lipoproteins of premenopausal women. A controlled diet study". Arteriosclerosis, Thrombosis, and Vascular Biology. 15 (2): 179–184. doi:10.1161/01.ATV.15.2.179. PMID 7749823. ^ Cuvelier I, Steinmetz J, Mikstacki T, Siest G (May 1985). "Variations in total phospholipids and high-density lipoprotein phospholipids in plasma from a general population: reference intervals and influence of xenobiotics". Clinical Chemistry. 31 (5): 763–766. PMID 3987006. ^ Brenn T (Sep 1986). "The Tromsø heart study: alcoholic beverages and coronary risk factors". Journal of Epidemiology and Community Health. 40 (3): 249–256. doi:10.1136/jech.40.3.249. PMC 1052533. PMID 3772283. ^ a b Penner EA, Buettner H, Mittleman MA (Jul 2013). "The impact of marijuana use on glucose, insulin, and insulin resistance among US adults". The American Journal of Medicine. 126 (7): 583–9. doi:10.1016/j.amjmed.2013.03.002. PMID 23684393. ^ Benatar JR, Stewart RA (2007). "Is it time to stop treating dyslipidaemia with fibrates?". The New Zealand Medical Journal. 120 (1261): U2706. PMID 17853928. Archived from the original on 2009-07-06. Retrieved 2009-04-29. ^ Meyers CD, Kamanna VS, Kashyap ML (Dec 2004). "Niacin therapy in atherosclerosis". Current Opinion in Lipidology. 15 (6): 659–65. doi:10.1097/00041433-200412000-00006. PMID 15529025. ^ Rader, Daniel J. (2004). "Raising HDL in Clinical Practice". Raising HDL in Clinical Practice: Clinical Strategies to Elevate HDL. Retrieved 8 October 2009. ^ a b Brewer, H. Bryan (27 December 2005). "Raising HDL-Cholesterol and Reducing Cardiovascular Risk: An Expert Interview With H. Bryan Brewer, Jr, MD". Retrieved 8 October 2009. ^ Chapman MJ, Assmann G, Fruchart JC, Shepherd J, Sirtori C, European Consensus Panel on HDL-C (Aug 2004). "Raising high-density lipoprotein cholesterol with reduction of cardiovascular risk: the role of nicotinic acid--a position paper developed by the European Consensus Panel on HDL-C". Current Medical Research and Opinion. 20 (8): 1253–68. doi:10.1185/030079904125004402. PMID 15324528. ^ Drexel, H. (2006). "Reducing risk by raising HDL-cholesterol: the evidence". European Heart Journal Supplements. 8: F23. doi:10.1093/eurheartj/sul037. ^ Meyers CD, Carr MC, Park S, Brunzell JD (Dec 2003). "Varying cost and free nicotinic acid content in over-the-counter niacin preparations for dyslipidemia". Annals of Internal Medicine. 139 (12): 996–1002. doi:10.7326/0003-4819-139-12-200312160-00009. PMID 14678919. ^ "Study: Boosting Good Cholesterol With Niacin Did Not Cut Heart Risks : Shots – Health News". NPR. 2011-05-26. Retrieved 2015-11-05. ^ "When is treatment indicated for high cholesterol level?". Archived from the original on 30 July 2012.